A childless baker and his wife (James Corden and Emily Blunt) are sent on a treasure hunt into the woods by a wicked witch (Meryl Streep). They are to find items belonging to: Cinderella (Anna Kendrick), Jack and the Beanstalk (Daniel Huttlestone), Rapunzel (Mackenzie Mauzy), and Little Red Riding Hood (Lilla Crawford). And when they bring these items back, within three days when the moon is fully blue, the wicked witch will reverse a spell put on the baker’s family so the baker and his wife can have a child. “Into The Woods” they go. Once in the woods, they meet up with a number of famous fairy tale characters in addition to those listed above. Johnny Depp is the Wolf in Little Red Riding Hood, Chris Pine is the Prince who searches for Cinderella after the ball (his singing is hilarious…I mean Capt Kirk singing…I guess I have him type-cast.) and Christine Baranski is Cinderella’s stepmother. Do they find the items in time? You will have to watch the movie to find out. An all-star cast highlights this musical mash-up of different fairy tales. Unfortunately, it is about 30 minutes too long, and in that time my rating of the movie took a steep slide down as it got darker and darker and quite stupid as the giant (Frances de la Tour, who was also a giant in Harry Potter) stomped around looking for Jack. “Into The Woods” is a PG movie good for the entire family with no f-words, but, some of the main characters die, which may be disturbing to those who are sensitive. 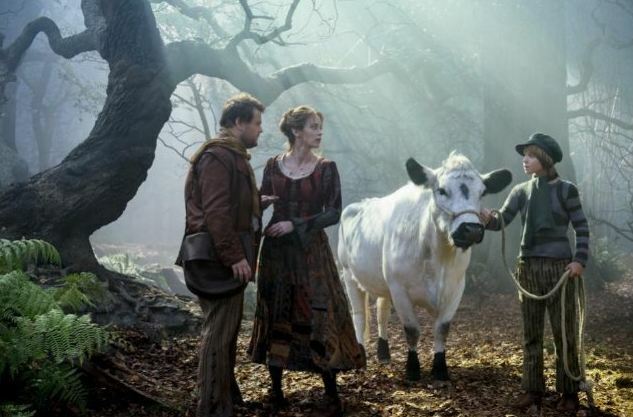 “Into The Woods” is ok, not great. But, to be fair,Kristen and Lori both liked it more than I did.